Kalia has a new plan, to set a world record. Unfortunately for him, and fortunately for others, it is bheem who ends up making the world record! The neighboring halwai is jealous of Tuntun mausis popularity and wants to steal her recipe. 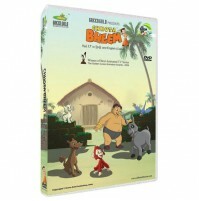 But Bheem comes in the nick of time to save the thing he loves most - Laddoos! Jaggu has a party in the jungle and he invites his friends to have some fun. The kids dress up like animals and have a great time. The kids enter a magical board game to be carried to different zones. Do they return home safe? Watch Inside!